Superb. Assisted me at home! However I am still Raid1 unbeliever and will get rid of may raid 1 at home asap. – see my post at Techrepublic – a nightmare. http://www.techrepublic.com/forum/discussions/102-387919… By the way whats the point of Intel Rapid Storage Technology app ??? seems useless. I really appreciate the failure simulation to see what the results would be. Great job of explaining how to use these windows 7 features. thanks! I am very happy with my (W7Raid1) mirror set on a couple of 1.5TB 7200rpm Barracudas which just outperform my much more expensive Velociraptor 300 system disk (using HDTune to compare). However, it seems that MS have implemented the design for resynching very strangely. The source disk for resynching performs r/w at normal speed, but the target performs at about 10% normal speed. Hence the resynching of a newly inserted (1.5TB) disk took 60hrs. In addition, it seems that Windows Update may, repeat may, apply updates to one of the mirrored disks, forcing resynching on next reboot. Can you comment, perhaps inform, on exactly how MS resynchs, and if there is any way to give it more priority and speed it up? Very nice and usefull article! I googled for this info and always foud only pieces what i needed. But here I’ve found all clear summarized. Great article it is very straightforward and appears to be easy to do. However, I have one question…why didn’t you mirror the entire C: drive…OS and everything. If you did that could you not just go on your merry way if C: drive decides not to work? What if I need to reinstall Windows. Will the new installation recognize the mirrored setup from my previous installation? What do I have to do? Any tips on mirroring an active primary boot disk “Drive C”? Do you advise against mirroring system disk/partition…? “you can pull one of the hard drives out and move it to another computer, and use the data. I can’t really think of a practical reason to do this” – I had to do this when a power supply failed and my spare power supply could only support 2 hdd and one dvd drive and I thought I’d replace the mobo while I had the pc open. 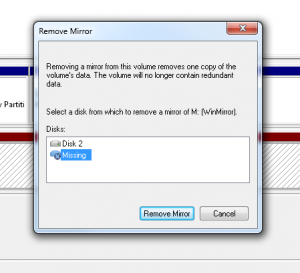 Initially the “missing disc” wasn’t listed in disc manager, “remove mirror” and “break mirror” were greyed out, and clicking “reactivate volume” generated the error “missing plex”. Right clicking the mirrored disc and selecting “offline” then “online” again and disc manager displayed the missing disc and allowed me to remove the mirror. Nice article. For those commenting about mirroring your boot drive, you really should read the article. This is a very clear article, can I suggest an addition – the conditions under which w7 will permit a RAID 1 mirror. For me the drive which I want to mirror has the new mirror option greyed out. But it’s there for a smaller drive ( which I don’t want to mirror). I think this is because the unallocated space is less than the drive I want to mirror (even though they are identical drives). I’m still working on this but the topic of what to do if the add mirror option is greyed out would be a good addition to your article. Are the same procedures used to mirror the “C” drive? I had a friend help me set up a RAID array with 4 drives, 2 and 2.. one for TV one for Movies. On boot up, the RAID says it is there, but during the course of me leaving for work, and returning, windows 7 no longer recognizes the array’d volumes. They are not in the list..
Any suggestions to help out? You state that using a software RAID for Windows is better. I have a question though as it seems that most imaging software does not play nicely with fakeRAIDs. Do you have a suggestion as to which imaging software would work well with a software RAID? You just mirror both the system reserved partition and your boot drive to a second empty disk. Both of the above will boot. If the mirrored drive fails no problem it will still boot from the primary as normal. If the Primary fails then unplug it from the m/board, plug the secondary drive into the port the primary was connected to and it WILL boot. When windows boots you can break the mirror, turn off the PC, stick a blank hard drive into the motherboard port the secondary was originally in, recreate the mirror as mentioned earlier an voila redundancy again. To tidy this up run “msconfig” to delete any non working options on the menu (test them first just to be sure) and also set whichever you want as the default. To change the menu text of the OS you are currently booted into you will have to run bcdedit /set description “menu description goes here” from an elevated command prompt. Do the same for the other working menu choice by booting into it them and following the above. The only issue I have found with using the Windows 7 Mirror function is that if your primary drive fails he mirror won’t boot, which really defeats the purpose of having 2 mirrored drives. any body have any idea of how to resolve this problem? That is without having to put my operating system on a separate drive. @anton .. there’s nothing wrong with the article, just plenty of ignorance on your part. For starters, you can’t create a RAID 1 solution on an existing Windows install – this can only be done from scratch and you’ll need at least 3 disks. I’m not going to bother with you though, so here’s a primer: http://www.tomshardware.com/forum/2109-63-setup-raid-existing-system. @@Rares .. if you’re introducing a mirror to a new Windows installation (which is what i believe your basically asking), you’d have to import the mirrored pair (foreign disks) to the new install, via Disk Management. So, no, Windows won’t recognize the disks (let alone see them in explorer) *until* you import them. I have a laptop with room for only one internal hard drive, which is a Toshiba 250GB. I also have an external USB v2.0 hard drive, which is also a Toshiba 250GB. Is there a way to Mirror from Internal to External? Should the external drive be disconnected for kind of a while and then reconnected, would I be asked to commit accumulated changes to this external drive immediately after plugging it in? Having just precipitated yet another ‘resynching’ operation by accidentally crashing my machine – (absent-mindedly hit the stop button rather than softly closing) I have had occasion to look a little further into why resynching takes so long. First, it is best to safe boot without internet. You cannot reboot during a resynch operation, it will start all over again. One drive is not being read, only written, and vice versa. The drive being updated is doing so at a measly 7MB/sec, this on a drive which should be in the 70+ bracket. But this time, I looked a little further and found that the queue length for the ‘target’ drive is 0.97. The queue length is what determines the update speed as the drive cannot service another IO request when it is already serving a current IO request, thus a well managed IO queue for a drive should be around 1. That is nearly the end of the story except one final thing… I have ONE spindle with a number of disks on each of my mirrored drives. If I had a number of independent spindles on a drive (imagine my 1.5TB was really 3 x 200G physical units) then the IO queue length could be as high as 3 and the resulting IO (writing) rate would be 21 MB/sec. I ask myself. Is it worth buying 6 new (cheaper) drives to replace my 2 current drives? It would add to everyday speed somewhat, but generally they are only ‘slow’ when facing a deluge of IO requests like this. Normally the caching keeps them feeling zippy. And I only do such a stupid thing about once a year and then have to wait for 3 days whilst my computer goes sluggish. (And I have a nifty laptop to get on with in the meantime for email and stuff). Hope this little bit of extra light on the subject will amuse or make someone happier. Just to anticipate someone a bit picky… should be 3 x 500G units. So difficult to differentiate drives from disks, hence used units. Great write up. It answered my questions regarding Windows 7 “New mirrored volume”. Thank you very much. I am not sure why people are even talking about mirroring the OS drive? We are talking about your end user workstation right? It takes all of 10 minutes to install the OS over again if it fails or the disk fails. You don’t really need redundancy for the OS. With that The mirror is more important for your personal data (documents,video,photos) that you wouldn’t want to lose. Great Article! Great job on explaining things! Right to the point. . . . Thanks! I’ve tried W7 dynamic disk mirroring. Setup is easy, but the recovery is quite “stupid” in my case. I have 4 partitions on each physical disk, so when the mirror rebuilds, the 4 rebuilds AT THE SAME TIME. This makes the rebuild very slow (and noisy), for the head jumps between the 4 partitions. Still, the portability advantage is undeniable. Why people want Mirror of the OS drive ??? So if we take that its a hardware failure of a harddisk in this case it would be preferable to have the mirror of the whole drive , not just the datas. I use the mirrowed system disk now for 2 years. Worked 100% perfect. No failiure. Can some one point me to a solution, how to use the drive on both systems? Thanks for your tutorial above, I found it quite useful, especially when having to replace a failed mirrored drive after just over 1 year of use! I followed the steps to add the new drive as a mirror of the surviving healthy drive, and the resynching seems to have completed (although I didn’t see it at final completion). After that process, it gave some warning that it was resetting the new disk (which I noticed in Event Viewer), and then an error that the disk controller failed (I think just because it was reset? not sure). Later on I went to check on the progress to hopefully find the mirror complete, but that is when I discovered the new disk was labelled as a foreign disk (and I found the above mentioned warning, errors issued previously). 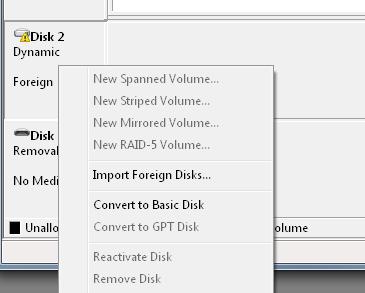 I reset the computer to see if that changed anything, but when it didn’t I went ahead to choose “Import Foreign Disk” as it was the only option not greyed out for the new disk (which was listed as currently offline I believe). With the completion of that, I now find myself with TWO separate drive letters, each with a copy of my survived healthy drive’s data — NOT the mirrored single drive letter that I had before and expected to return to. Do you know why this would happen? And what are the precise steps I should take to re-try setting up the mirrored drive (ie., should I delete the new disk’s volume and try to add mirror again, or format the disk and then try to add mirror, or something else)? I don’t want to try deleting any volume or formatting until I copy all my data to a new external drive as an extra backup in the next few days (I am scared the drives MIGHT still be linked as in a mirrored situation, but just not showing up normally?? ), but I would like to know how this strange copied drive rather than mirrored drive state occurred or at least the safest way to set it back to normal. Setup a mirror on Win 7. Need to access this drive on the network, but it is saying I don’t have permission. I can share my c and d drive on the same computer without any problems, just the mirrored drive has issues. Does it have to sync first? Any suggestions would be appreciated. Figured out the problem. I needed to add EVERYONE to the group list on the new drive. Then it was recognized on the network. To set this Windows 7 Raid up, is there BIOS setting changes to be made ? Or is it as simple as installing one hard drive & loading the W7 OS to it. Then opening the box & adding two more of the same size & type drives. Then config W7 to a Raid set up ? Thank you!! After a lot of searching and reading other websites and help pages, your walk-through is clear and complete. I finally know what and how to do this. Much appreciated. Hello, just wanted to ask if a RAID1 mirror created on W7 is compatible with W8. I have a problem. I have to 240GB SSD in RAID1 using my BIOS RAID controller, and an additional SATA drive at 2TB. I installed Windows 7 to the RAID mirror set without issue, using the native Windows RAID drivers. My issue is that now, Windows does not see my 2TB drive, which it DID see before the mirror set was built and Windows was reinstalled there. My motherboard is an ASUS M4N68t-M with nVidia MediaShare RAID controller. Any help would be GREATLY appreciated!! In a Dell Precison T3400 with an Intel Core Duo, I have raid mirroring set up in the BIOS and it says that (forgot the exact word) the syncing will take place in the operating system. Is there a way to see this while it is happening? I have two 80GB drives which BIOS identifies but Win 7 sees just one drive at 74GB. Seeing this is the first result for Google search “Windows 7 Raid 1”, I think it’s important to point out that everything K said is true. Also Lars is incorrect in saying “you can’t create a RAID 1 solution on an existing Windows install”, you certainly can if you use Windows’ own mirror array. Wrong, Wrong, and again Wrong. There is nothing wrong with this article, other than perhaps a person should not rely on RAID-1 mirroring as a means for data backup. Data Redundancy is NOT Data Backup. For example, a computer power supply can fail and fry all attached drives. In addition to RAID, always have a backup, preferably on external media. The link you posted to the tomshardware forum is also misinformed. The truth is that in fact there are three types of RAID (what are typically called) Software (Windows in this case), Firmware (motherboard), and Hardware (eg. PCIe Controller etc.). With Firmware RAID and Hardware RAID it is typically required that the OS be installed onto an existing RAID volume set. This is NOT the case with Software RAID. Windows will allow converting an existing volume into a member of a Software RAID volume. This includes an existing Windows OS volume, which can be converted into a member of a Software RAID. “Windows will allow converting an existing volume into a member of a Software RAID volume. 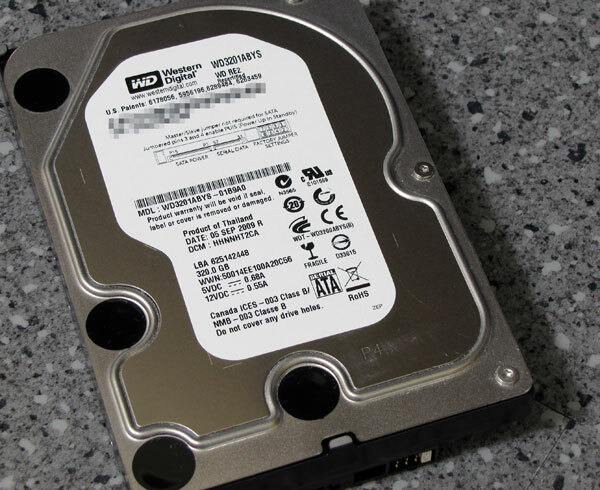 With this in mind, say I want to replace an aging single drive with a Software RAID, would the process be to mirror the old drive to one of the new drives, then replace the old drive with the other new drive and resync? I was able to make a bootable mirror of my c:/ containing windows7 OS by following K’s direction re mirroring both the SYSTEM and WINDOWS volumes. After simulating a primary drive failure I was also able to boot from the Windows7 – Plex WITHOUT moving the sata cable. Unfortunately after reconnecting the primary drive it seems that Windows is unwilling or unable to reinstate the existing mirror. You can boot from either drive but whichever drive you are not booting from will show as “Foreign”. I have been unable to find a way to reinstate or repair the existing mirror. The only solution is to adopt the foreign drive, which breaks the mirror, and returns both drives to simple mode. At this point you would think you could repair the mirror but nooooo!. All you can do is delete the volumes and rebuild the mirror from scratch. So it does work. BUT if you test it you will have to rebuild it. I think I found something for the guy who discuss about the synchornising speed. The speed for (1) was really good: 100MB/s average, but the (2) was very very slow 5MB/s average. I removed the first one before it finish and try to plug the drive in different SATA port. At first their was on ports number 4 and 5. Finally I have connected the HDD on port 3 and 4 and the speed of sync was good 100MB/s. The thing is, in my motherboard the SATA port are linked 0-1 / 2-3 / 4-5. I think that hard drive on different sata line will synchronize much faster than in the same line. Wanted to setup RAID 1 using 2 new 3TB drives I just picked up for my existing build, but all of the Raid options are greyed out and you make no mentions of what to do if this happens which would have been nice. So thanks for the great start, sadly for me it didn’t work. Time to do more googling. For a complex setup on the boot drive, I suggest a normal C disk, a mirrored D (or E if you have a DVD) disk, and a SYSTEM IMAGE backup of C after it’s stable to E. If necessary, take other images later. This way, if you lose C drive, you can still recover from E the whole setup with a System Recovery disk boot. (USB or DVD). Foto simultaan op meerdere lokaties "saven"